If you didn’t read my rant last week in response to the Telegraph article about the letter from 100 top chefs up in arms about the new allergen regulations, where have you been? Social media has been buzzing with irate allergics and coeliacs but not much from the supposed Top Chefs in question. First of all, the chefs and restaurants who complained were not top chefs. The letter was conspicuously empty of any top names. Instead, they were independent restaurateurs who perhaps have more cause for concern about the new regs? Maybe, maybe not. Some of the most clued up places have been just that; small establishments with flair, creativity and a passion for making everyone’s meal enjoyable – even the allergy freaks like me. However, within hours of sharing this blog, BBC Radio 5 Live contacted me to ask me if I would join the Phil Williams show that evening so of course I agreed, with some trepidation. They were going to get Prue Leith on but felt it would be more interesting to hear the other side of the story. Interestingly we haven’t heard anything from any other chefs, except those who are standing up for the regulations and have a more positive outlook, like the very lovely Aldo Zilli who says chefs should see it as a positive thing and embrace it. So there I was in a studio in Wing at 10.30pm, which was more like a cupboard under the stairs, waiting to be bombarded with questions. For 20 days you can listen to the interview here: http://www.bbc.co.uk/programmes/b054p096 Skip to 25 minutes to avoid endless drivvle about Jeremy Clarkson. It was a tough interview, very rushed, but he at least had his facts correct which was refreshing for a start. Words fail me. Prue if only I had videos of myself being rushed to A&E I would share them with you so you could see – they make us dreadfully ill. And I know you mean all these other weird allergies that are less well known, but just because they are rare does not mean they cause less of a reaction. Phil Williams kept interrupting, cut me off mid flow on nearly every point I tried to make, but I held my own and I think managed to answer all his questions. I think he was rushing to get the feature done and back to the more interesting news. I just knew he would ask, “So you seem so good at coping with eating out, why can’t we just stay the way we are with you phoning the restaurant and checking with staff, why do we need these regulations?” I think I gave as good as I got and had a succinct answer to all his questions, because the thing is, whilst I have great plans in place for making my eating out experiences safe, I have had so many near misses. Some due to my mistake but most due to cross contamination, poor communication and staff not checking. This is serious stuff and these regulations should make eating out a much safer place for all of us with allergies, coeliac disease or food intolerances. So a huge thanks to Radio 5 Live, Phil Williams et al for giving me the chance to put across the allergic diners perspective. We heard a lot from #noclueprue so it was about time we had our say. Just to have that forum was fantastic. Can we have a larger feature next time? It was so short. Maybe even on a programme more people are listening to… Come on media – show the real news, about real people – not the moaning chefs. 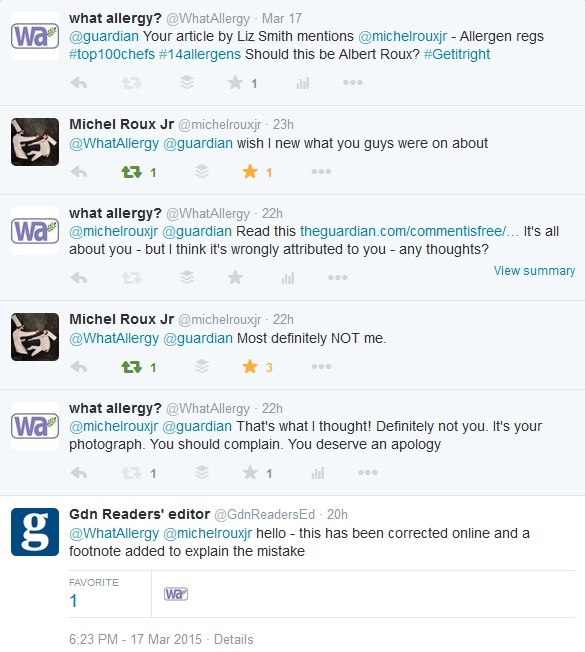 Michelle Berridale-Johnson shared James La Fanu’s roundup of news in the Telegraph where he refers to the allergen regulations furore – his column is called the Doctor’s Diary but he seems to have very little grasp on the real facts around allergy. Using the LEAP study where kids were de-sensitised to peanuts hardly gives much real hope – this was a tiny selection of lucky children who had the treatment and can now eat peanuts – the rest of us are unlikely to see such cures available in our lifetime. It’s just too costly. Read “The Telegraph needs to get a grip of the facts” here. Chef Hermes has also written an angry response, “The follow up – 100 chefs write to the daily telegraph about allergens.” which gives another side to the story. Don’t bother trying to comment because you’ll probably get flagged as spam. He does clear up something that was bugging me when I read The Guardian response from a Coeliac. It is great to see coverage in the Guardian from a writer, freelancer and coeliac but it was very misleading, quoting Michel Roux and Prue Leith as having both signed the letter. It was actually Albert Roux who signed the letter. If we are going to complain about this we must have our facts straight too but on more careful reading there was a link to another blog by Liz Smith (who blogs at Not Another Gluten Dodger and is a coeliac) discussing disappointing comments made by Michel Roux and Monica Galetti about troublesome difficult customers, like those lifestylers and gluten free types made on the BBC Food & Drink programme last year. You’ll see some of the original wording and image in Chef Hermes blog, but if you visit the Guardian now there is an apology and the article has been amended. I don’t however agree with Chef Hermes comments about the rest of the article. I think it’s a good piece putting across the coeliac’s side of the story which has been pretty much ignored thus far. And I think Lisa was clearly referring to Michel Roux’s past comments so he’s not altogether innocent it would seem. However it was a while ago and his views may have changed since then. So far this month I have been on Radio 5 Live and Michel Roux has actually tweeted me. I’m easily pleased ;). I am saddened however to hear that Liz Smith has received negative and trolling comments since this mistake. Come on people. It’s not necessary, it’s not nice, and there was some context to the mistake which I thought needed clearing up. Cowards troll. Reminds me of the awful comments I received after being on the BBC. Best not to read them but that’s easy to say. So who heard me on the radio then? Be quick and listen before it disappears. Trying to see if I can get it saved somehow. I have some very clever techie friends. For 20 days you can listen to the interview here: http://www.bbc.co.uk/programmes/b054p096 Skip to 25 minutes.